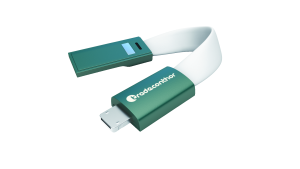 Tradeconthor secured itself an award in the category Communicative Products with a charging cable. The special thing about it: According to company accounts, the 2-in-1 charging cable is the first one to feature two types of connections – for Apple and Android models – in one universal connection. This makes the cable compatible with all popular smartphones and tablets. Furthermore, thanks to its clever, exposed magnetic closure system, the 4.5 cm long cable can simply be attached to one’s bunch of key and is thus always ready at hand when one’s battery starts running out. The 2-in-1 charging cable is packed inside a recycling box and is available from January 2017 onwards as, according to Tradeconthor, the first charging cable made of organic plastic in the world. The connection and the cable colour can be dyed to match the customer’s wishes or CI design for minimum order quantities of 500 pieces. The connection can also be customised with a logo print and the packaging can also be individually designed.